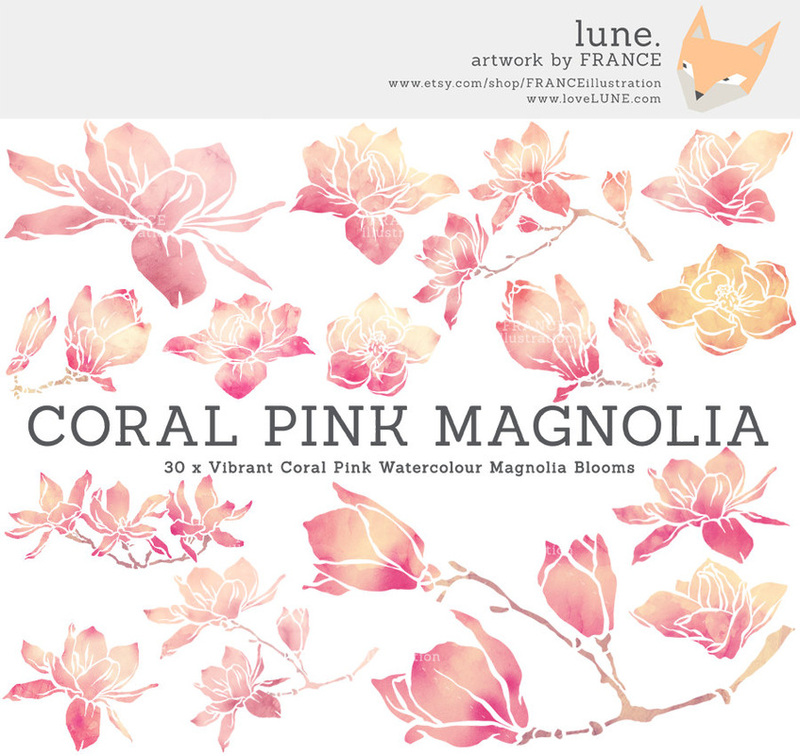 This artwork was Inspired by the magnolia tree outside of our window. These soft watercolour magnolia blooms and branches are perfect for wedding and party invitations. A beautiful take on our original magnolia flowers. 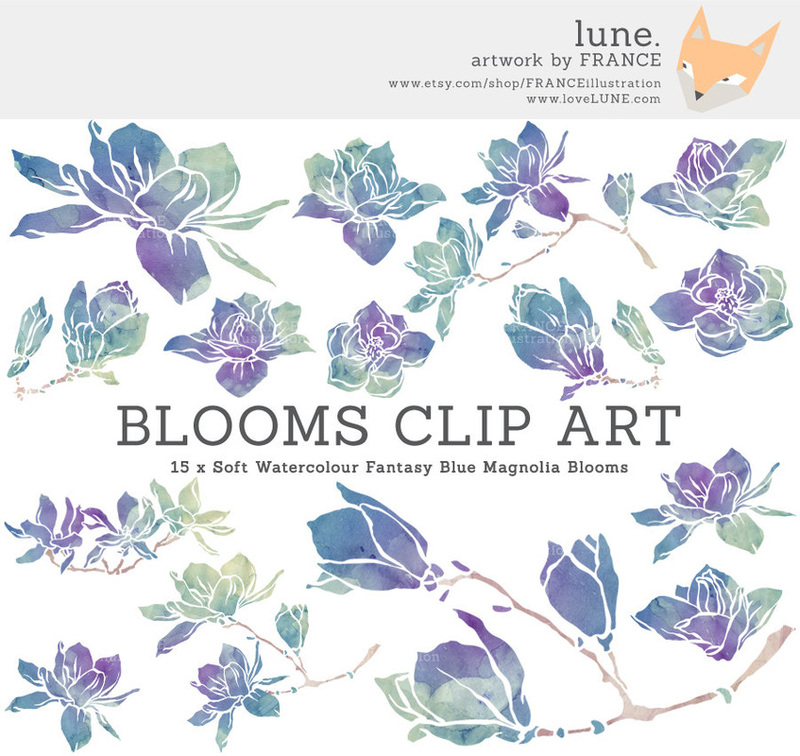 These blooms feature a fanciful sea blue/green and amethyst purple. There are subtle variations of colour throughout these blooms, ranging from soft pastel pink through to vibrant peach, fuchsia and orange. Use them individually or in conjunction with each other, or with blooms from matching sets . The magnolia tree outside our window is still in bloom, and we were inspired to make a new floral set. 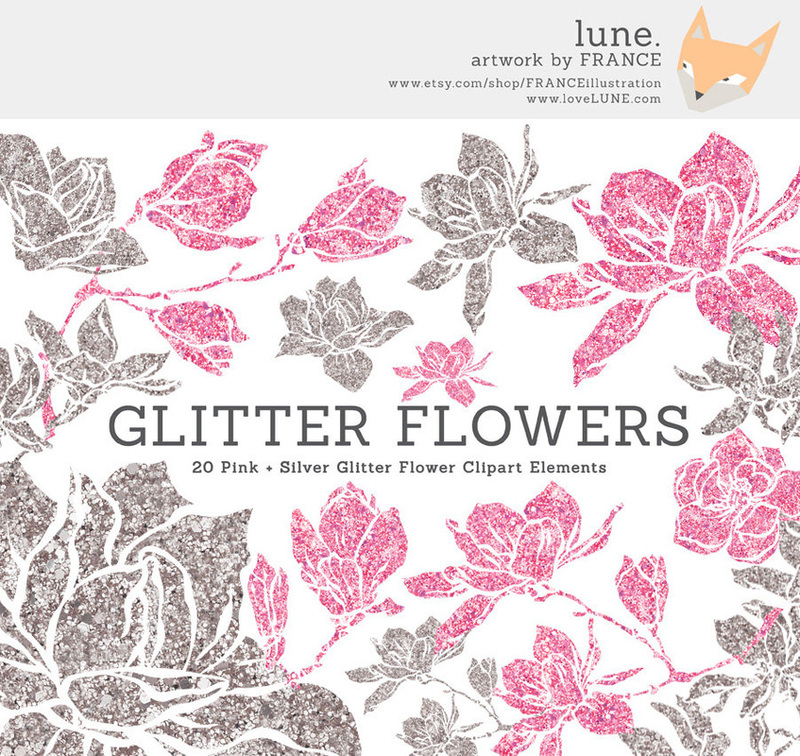 This time it's a bit more glamorous, with a pretty pink and silver glitter texture. These would glam up any Wedding Invitation or Party shout out. 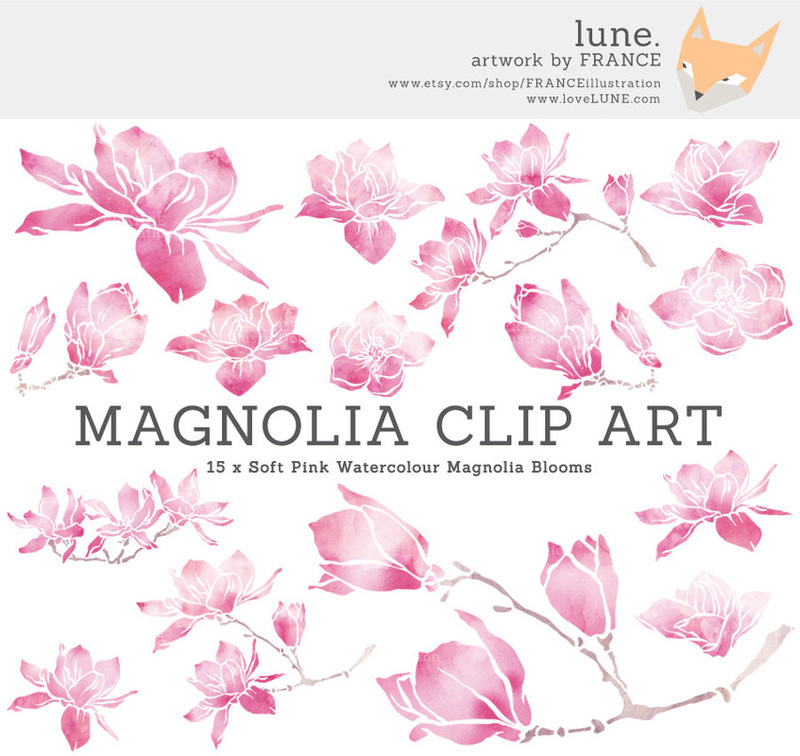 Another Magnolia clip art set. This time it's a bit more glitzy, with a golden glitter texture. 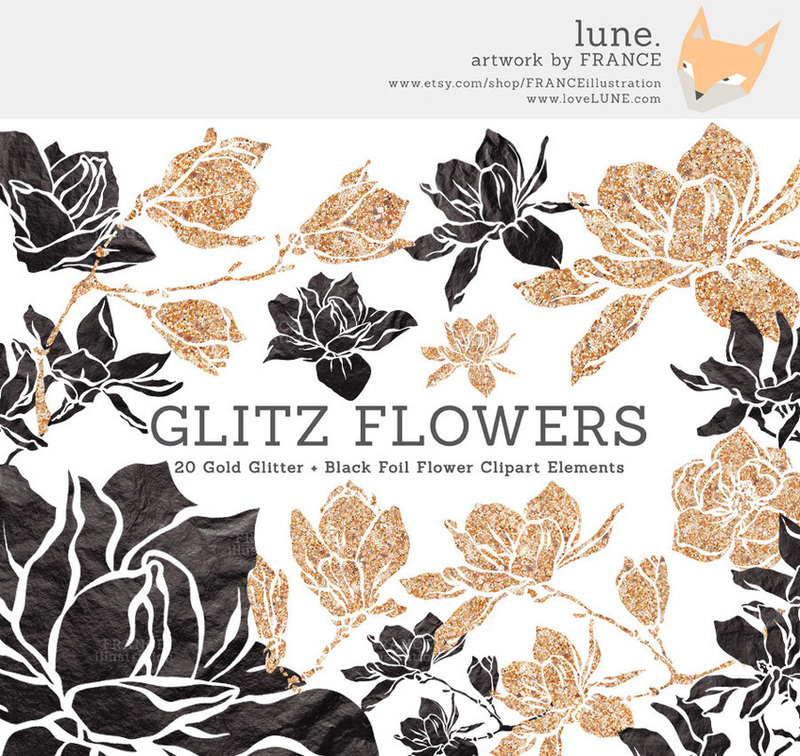 Included with these glittery florals is a contrasting matte black foil/paper effect flower. They combine to make for a very striking and glamorous visual effect. "Beautiful designs, love this set!" - Nastasia Cook, 11 July, 2014. "Very pretty and I look forward to using them! " - Renee Avard-Furlow, 4 June, 2014. "Very beautiful, i love it!" - isistyara, 26 May, 2014. "These were super cute !!!!!" - Vanessa Fedorowski, 22 May, 2014. "Very pretty, good quality graphics!" - Sarah Jean, 29 April, 2014.